As a young sports reporter for the Newark Ledger/Star-Ledger in the late 1930s, my first professional sports assignment on an ongoing basis was the Thursday night wrestling bouts from October to May at the Laurel Garden sports arena at 457 Springfield Avenue, near the intersection of 18th Avenue and South Tenth Street. The weekly wrestling program, while out of favor in New York City, was still wildly popular in Newark and attracted a loyal following to the Springfield Avenue arena for the weekly mayhem, orchestrated by Polish born Jack Pfefer, who 'owned' and programmed the weekly shows in a number of metropolitan New York area cites, among them Newark, Paterson, Teaneck, and Jersey City. My assignment came from Ledger sports editor Joe Donovan, and I dealt with each week's happenings as I would with any other regular sports assignment. Little did I know then that there was a family connection between Donovan and Willie Gilzenberg, operator of Laurel Garden, and that I'd most likely been given the assignment as a compromise between ignoring the matches entirely and wasting the talents of a senior sports reporter. About the year that I began wrestling coverage for the Ledger, wrestling was under a great deal of cynicism from both the public and the press after an expose of wrestling's fakery had appeared in the New York Daily Mirror. That year also, Madison Square Garden had dropped professional wrestling entirely as a result of the bad publicity from that expose. I recall, after the Laurel Garden matches, taking a No. 25 Springfield bus down to the Ledger office, writing my story, and later billing the Ledger 10 cents on my weekly expense voucher for "Laurel Garden Wrestling", five cents for the bus each way. Who were some of the wrestlers who performed at Laurel Garden from Jack Pfefer's 'stable'? Names I recall after more than 60 years include the five wrestling Dusek brother, Wally, Ernie, Emil, Joe, and Rudy. I also remember Maurice LaChavalle, "The Swedish Angel" and "The Golden Angel." Many of Pfeffer's wrestlers were European 'imports' - Poles, Russians, and Ukrainians, whom he built up as contenders against popular American names, sometimes former 'name' athletes. Pfefer's wrestlers with Eastern-European ties would attract a wide following in the foreign-language press and it helped to ensure good attendance at their wrestling matches. Ring Magazine had written at that time that these matches were, after all, only exhibitions, and that there could be no kick from the fans because they knew what to expect and got what they came to see - good entertainment. Whatever the Laurel Garden wrestling matches were, the Laurel Garden management expected the press to deal with them as sports events. I remember after I returned from a night's coverage at Laurel Garden, as I typed my story for the next day's Ledger, I saw, peering over my shoulder, one Carmine Bilotti, the Laurel Garden publicist. Apparently he must have been satisfied with what I was typing because he made no comments or suggestions. All of the wrestling matches I covered at Laurel Garden, and, I understand, all that followed, were refereed by one Hymie Kugel. I never focused my attention on Kugel as he performed his labors, but one former Laurel Garden regular who did recalled for me that the burly referee was "one tough cookie." To the best of my recollection, the last wrestling show I covered at Laurel Garden was on Thursday night, December 4, 1941 - less than 2 full days before the infamous Pearl Harbor attack that started World War II. One year later, on that same date, I was in uniform, rifle resting against my shoulder, and marching in formation down the boardwalk in Atlantic City with other Army Air Force recruits, my basic training having been completed that day at nearby Brigantine Field. Willie Gilzenberg, the Laurel Garden wrestling promoter, and later manager of the boxing career of "Two-Ton" Tony Galento , died in 1978 at the age of 79. Laurel Garden is no more. Its life as a sports arena ended May 30, 19531, just before the building was demolished. But for former Newarkers who witnessed the matches at one time or another at Laurel Garden, or perhaps my write-ups of the Laurel Garden grapplers as I described them in the Ledger sports pages, this recollection may evoke some warm memories. Long before I involved with reporting the wrestling shows at Laurel Garden, the wood-framed building on Springfield Avenue had been famous since the 1920s as a boxing arena2. Some of the biggest names in boxing's history had seen action in the Laurel Garden boxing ring. Among them was Mickey Walker, Tony Canzonieri, Harry Greb, Billy Petrelle, Joe and Vince Dundee, and Young Bob Fitzsimmons. Louis Firpo's first two American fights were there; also Max Schmeling. And heavyweight James J. Braddock knocked out George Gemus in a Laurel Garden slugfest in 1929. Tony Galento, in January 1929, just two months shy of his 19th birthday, went to Laurel Garden with a friend to watch the fights. When one of the main event bout fighters failed to show up, Galento substituted for him at the last minute, and won his first 'pro' bout with a third-round knockout. A little over ten years later, in June 1939, Galento missed winning the world heavyweight championship by a few seconds. In the third round of a 15-round title go with the great Joe Louis, Galento connected with a left hook and had the champ down for a nine count. My old Third Ward friend, Lou Halper, got his start as a boxer there, too. He first started by hawking morning papers outside Laurel Garden on boxing nights. Later he came inside as a fighter when exiting boxers told him he could make more money in the Laurel Garden ring than outside selling papers. Lou Halper worked his way from the Laurel Garden ring up to a non-title bout with world champion Barney Ross. On June 10, 1957, when I staged a "This is Your Life, Lou Halper" at Hillside B'nai B'rith, I had the thrill of introducing Barney Ross as one of Halper's surprise guests. Another surprise guest I introduced that night was Tony Galento. Laurel Garden had originally been operated as a German beer garden and show-house for German films. However, sometime in the 1920s, it was purchased by real-estate wheeler-dealer Charlie Zemel, the Newark-born son of Jewish immigrants from Russia, whose formal education ended when he was expelled from the sixth grade in a school in Newark's Ironbound section. He employed Willie Gilzenberg to manage and operate the arena's boxing and wrestling programs -- wrestling on Thursdays, and boxing on Mondays. On nights when there was no boxing or wrestling, from 1929 to 1933, Laurel Garden was operated by the building owner as a roller skating rink. Skating was a popular social activity for young people in that era and the rink attracted huge crowds, charging only a modest fee for an evening of skating and socializing. The building owner's teenage daughter, Blanche (now Mrs. Blanche Herberg), the third oldest of his eight children, worked the refreshment concession during the skating sessions. 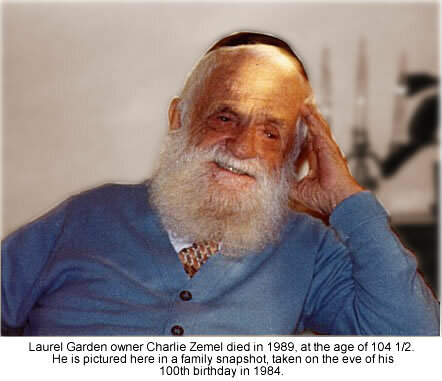 Zemel's ownership of Laurel Garden continued until his death in 1980 at the age of 104 ½, in Miami. At the time of his death, Zemel had owned hundreds of Newark properties in addition to Laurel Garden, including more than 1,000 rental units, the Newark Armory, and three theatres near Newark's Penn Station.